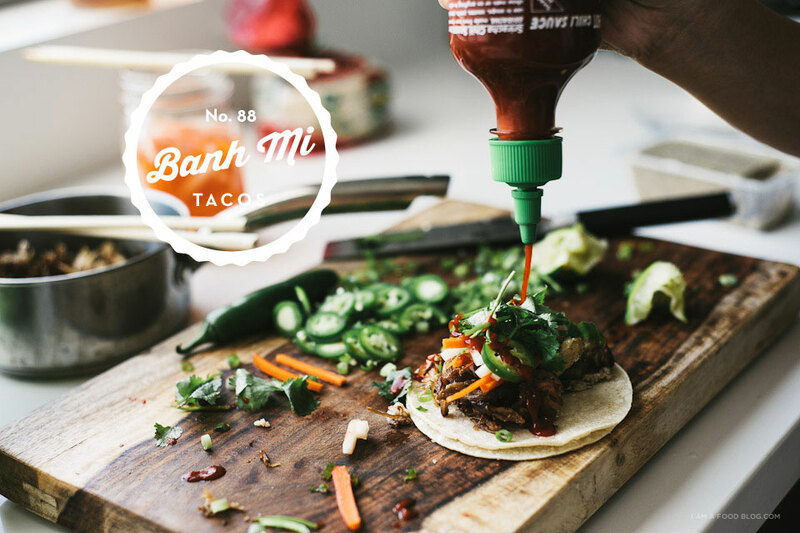 These banh mi tacos combine two of my favourite things: banh mi and tacos. Sometimes it not so easy finding fresh Vietnamese baguettes (I’m quite picky about the bread my banh mi is made on) and for some reason, using tortillas seemed like the obvious answer. 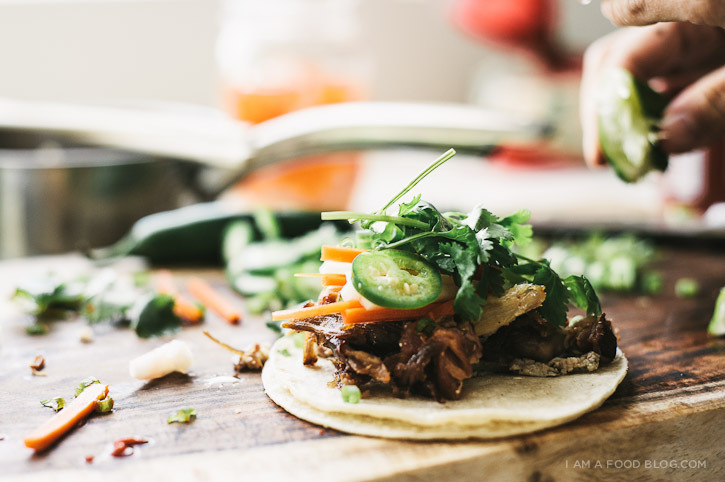 Vietnamese and Mexican food share a love for limes, cilantro and spiciness so it’s natural to pair them up. If you have all the ingredients sitting in your fridge, these tacos are a breeze to make up. I used some left over pulled pork as the meat, but feel free to substitute in any protein you like. What makes it taste Vietnamesesque are the mayo, pickles, and cilantro. If you don’t have any pate sitting around, don’t bother heading out to the store, but if you do have it, it adds that extra layer of umami that real banh mi have. 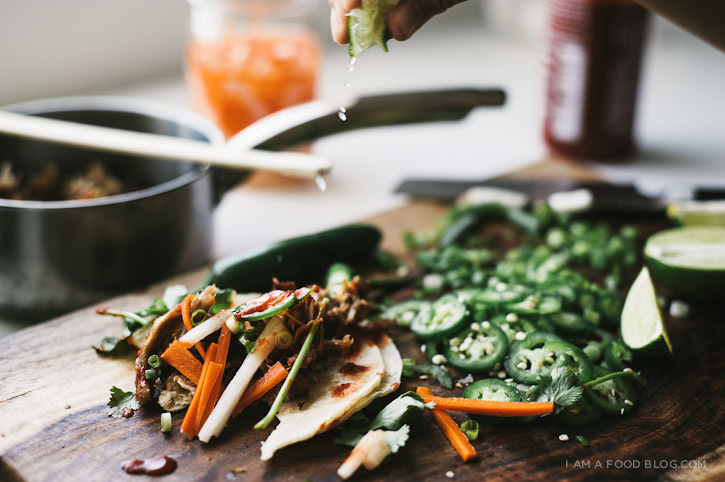 Simple, refreshing and addictive, these little tacos were the best lunch treat ever! 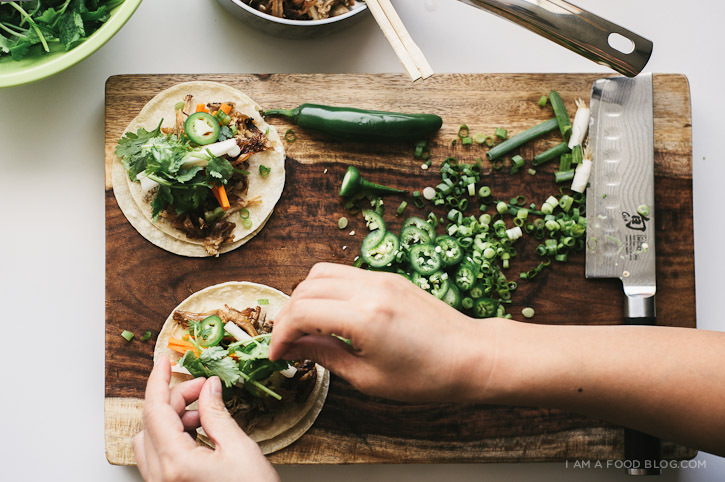 i am sandwich insides, i am in a taco: i am banh mi taco! Make the pickles: In a bowl, sprinkle the salt and sugar over the carrots and daikons. Let stand for 30 minutes, rinse and enjoy. Warm your tortillas, spread with a bit of pate, squirt on a touch of mayo, and pile on the pulled pork. Top with daikon, carrots, jalapeños, cilantro and a squirt of sriracha. Squeeze on some lime and you’re good to go! Make as many as needed. 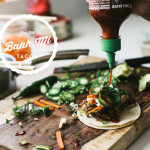 The banh mi is one of my favorite sandwiches, it’s only natural that I turn it into a taco. Why have I never thought of this?!! Thanks so much for the inspiration! YAY! I’m so glad you’re back. Catching up on all your latest posts — these look amazeballs. Great idea! Vietnamese baguettes are crunchy on the outside and so light and airy on the inside. There is a bunch of Vietnamese places where I live in SD and one thing is for sure, they are damn good bakers. I’m sure being colonized by the French had something to do with that. what is kewpie mayonaise,please? And where the heck do you find pork pate? I had my first Banh Mi in NYC this weekend – to die for! Would love to attempt this recipe. Hi Tammy-Kewpie comes in a squeeze bottle…it’s found in Japanese markets! It’s a bit more umami than our regular traditional mayo. We use it commonly for okonomiyaki or takoyaki too…anything with Asian influence. I don’t know this for sure, but I’ve heard that Vietnamese baguettes, the kind used for Banh Mi, are made with some rice flour. I am looking at these and my mouth is watering! I swear!! Oh, I am all over this. Gorgeous. Wow! These were fantastic. Used your slow-roasted pork shoulder recipe for the protein, and it was superb. I love everything sriracha. Your recipes are delicious. Thanks for sharing. I have about 1000 recipes bookmarked on my iPad and would LOVE to print them out. Do you have a print link on any of your recipes? Sorry if I overlooked it!